Ten new number patterns have been added to the PinBroidery pattern collection. They feature the numbers 0 to 9 entwined with decorative flowers and leaves. Numbers can be combined to make any number. The individual numbers are centralised on the pattern. When two patterns are combined they will look more attractive if each number is moved towards the centre of the combined pattern. To create a pricking pattern for the number 21 print out numbers 2 and 1. Trim the left-hand edge from number 1. Overlap the two patterns using the box outlines as a guide to getting them level. When you are happy with the spacing join the two patterns together with clear self-adhesive tape. You pattern is now ready to place over your blank greetings card to prick out the pattern. Centralise the number on your card before proceeding. If you have any comments about the numbers please let me know by adding a comment to this post. This entry was posted in PinBroidery on Saturday 4 July 2009 by David Jefferson. David, thank you yet again for beautiful designs. I agree with Cathy, these designs are going to be great additions to the embroidered cards. I hope that the ” Initials” are in the pipeline David !!! You asked if people were against seeing their age on a card. With my friends I have to admit up to a certain age–it doesnt matter. When they reach that cut off number-you have to really know the person to advertise the age. But if you know the friend is sensitive to the number–do 21 and a big smile inside. I am please to hear your suggestion that scrapbookers might use the stitched numbers, Cathy. I would be interested to hear from people doing scrappbooking just how much stitching they incorporate into their work. they are great, and I can think of many uses. Any chance that there may be some letters to go with them in the future maybe? I have bought all the cards so far and love them. Last week I downloaded the new Christams ones and just love the script on the Happy Christmas – the only one I have sewn so far!!! I plan to add more words where they are appropriate to the design, Sandie. I need some inspiration. I love the numbers for females but they dont work for males–too girly. Any ideas on how to use them for men? Just the numbers look pale to the vines. 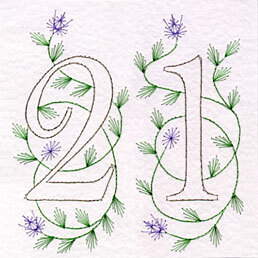 The number 21 picture in this blog is an illustration and is not intended to be used as a pattern Harriett. All numbers are available for purchase from our on line shop.